ACAMPORA proudly introduces its new Pure Essence, an original Aromatic, Floral, Woody creation that perfectly fits with our original, sensual and anti-minimalist collection of Pure Essences. Unisex as all of our perfumes, VOLUBILIS is a somehow multicultural global fragrance, which owns its name to an ancient Roman empire colonial town, in Morocco: the same country producing one of the most precious roses used in this new fragrance. Suave and delicate in its 'feminine' side, with a gorgeous floral heart, VOLUBILIS is unexpectedly sustained by its pure peppermint notes and shows its 'masculine' code when refined woods come into play. Exploring a gorgeous palette of olfactory sensations, VOLUBILIS is a complex and quintessential unisex fragrance, uniting opposites, fresh and sensual at the same time. An everchanging new olfactory signature, by ACAMPORA. The notes feature pink pepper, bergamot, peppermint, rose, iris, patchouli, vanilla, amber and musk. 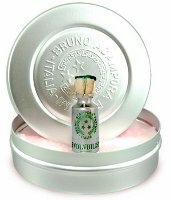 Bruno Acampora Volubilis can be found now at Luckyscent, $185 for 10 ml Perfume Oil. I haven’t been able to do mint in a scent as of yet. Can’t do it. We are evil twins again…I love mint. I like the thought of a woody floral, but I have a hard time imagining how the pink pepper and peppermint would harmonize with the rest of the notes. I fear they would dominate the composition on my skin and leave me smelling like a salad. Hard to tell without smelling it. I do love their Jasmin. Yes, they’re not bargains! I think they’re available in EdTs or EdPs now, which must be cheaper but I don’t know by how much. Are they especially complex and full scents (or merely revolutionary)? You know, I don’t even know if I can tell if a scent is complex when it’s in perfume oil…there is so little sillage & movement. Sounds like it could work as a summer scent. I want to try this line. Badly. Italian niche, just what the heart needs.